Berakah Arts are proud to announce that we have launched our new multi faith youth ensemble which would be the first of it’s kind in the world. INCREASE THE PEACE is based at St. Mary’s Church, Acton on Tuesdays from 4pm till 6pm. Young, talented musicians meet here to rehearse and perform songs that send an up lifting and positive message into the community. The aim is to perform live so subscribe to our newsletter for up dates. The band is tutored by the founder of Berakah Arts, Mohammed Nazam, a professional musician and music educator with over 25 years. 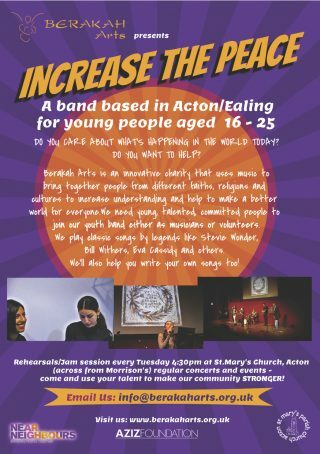 INCREASE THE PEACE is looking for young people from all faith backgrounds to take part in this project so if you want to lend your talent to a band that is doing something positive about the much needed Unity that our world needs, get in touch. The Berakah Project is an innovative charity that creates music to transcend barriers built by faith and culture, and to bring people together in a spirit of understanding and shared values. As a band we feature musicians from Jewish, Christian and Muslim faith heritage and for the last 10 years we’ve played concerts and hold workshops in schools and community centres across the UK building a strong reputation.